It’s been blustery and rainy the last few days. I could complain, but I won’t. I live in Oregon’s beautiful Pacific Northwest and rain is expected. And even prayed for when we are approaching spring and it’s questionable whether there has been enough measurable rain to keep our forests sated well into the summer months. So I feel celebratory plinking away on my keyboard, listening to missile like rain drops pounding outside my window and savoring these last few early spring weeks before I am full on in garden mode. 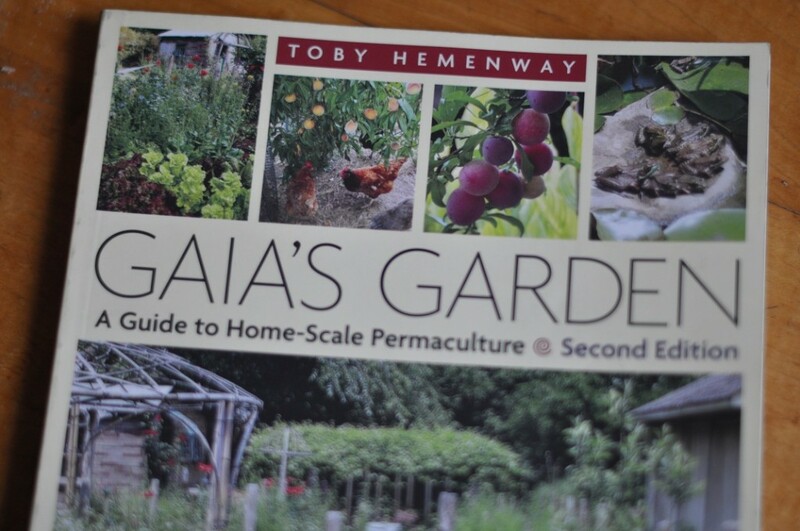 AND sipping a little more tea AND soaking up fabulous information from this book, Gaia’s Garden, a guide to home-scale permaculture. The following are my takeaways from this shelf worthy book- best consumed with a cup of tea! In nearly 30 years of gardening, I have grown from a green sprout in knowledge of plants and general gardening know how to a deeply rooted garden tender and truly observant towards embracing less arbitrary methods and tapping deeper into a more holistic approach. In permaculture the gardener is, front and center, an integral part of the ecosystem. Instead of a mere servant to laborious tasks and chores the permaculturist looks for an A to their Q: How can I conserve my energy and create a garden that is easy, healthy and abundant? A few changes in practice are baby steps towards that goal. Here are three to consider, and to help you on your way to a healthy sustainable garden. Think of a circle with your home somewhere in the loop. From your doorsteps, how far is it to your garden? Remembering that you the garden tender are the main beneficiary of a flourishing garden ecosystem, you can optimize energy and efficiency when the garden is near your dwelling, and in close proximity to your compost system or livestock. When did we start having the garden out yonder? Bring resources closer to your home and outdoor living space. Build your soils vitality. The very substance that we want to sustain our beings and bring nourishment and beauty into our lives needs nutrients that organic matter provide. Simply put, don’t give away or shuffle off to the land fill the components that a good compost is comprised of ie; dying or dry organic garden matter, animal waste, kitchen waste, tree trimmings, etc. Compost it and uppen the earth in your landscape. There are methods of composting that can be modified to suit your preferences. I have nicely developing piles close to my garden, but I am thrilled about practicing something new this year that I learned from Gaia’s Garden. Sheet mulching in place. Instead of carting nutrient rich compost from pile to garden, I can create small parcels of sheet mulching (layering compost components) right in the garden space. As the compost rots under the mulch the nutrients are ferried right to plant roots. Easy Peasy and energy saving for this garden tender. Our love of a tidy and neat garden space is imprinted on us by culture. Lawn is by far and away the largest mono crop in our country. But step back will you? And consider diversity as a means of bringing health and vitality to your garden. Plantings that consist of trees, shrubs, ground covers of varying heights and succession of leaf and bloom create a diverse habitat that will encourage beneficial insects to your garden and as a result your pest problems will shrink. I encourage learning about native plantings in your area and including them into your garden plans. Natives are proven winners for success and help to restore habitat and add vitality to your garden. Commit to limiting if not eliminating your use of pesticides & herbicides. And only use them after thoughtful consideration of natural alternatives. Apply judiciously. It’s costly not only to you but to your soils health and fertility, and detrimental to our streams and rivers. Studies show that over use of these chemicals is epidemic. Unfortunately we lean to the “more is better” mentality. I’ve been guilty of it. I’m sure you have to. Let’s just stop it. Look at weeds in whole different light. Many supply the soil with nutrients by pulling them deep into your soils substrate. Many are medicinal and packed with vitamins and minerals for you the gardener, as well as a lovely addition to your compost pile. A little dandelion does the body good! Spring is just around the bend. I hope you’ve been inspired to get out into the garden and create something beautiful and nurturing. In the right hand column you can find me on Twitter and Instagram with more tips and insights into sustainable gardening. This entry was posted in Composting, Garden Stuff and tagged composting, Gaia's Garden, gardening, Permaculture, sustainability.